Every year for the Print ‘n Fly magazine, I write a science fiction story. Well this year I missed the deadline, but you can read it here now. In the southern regions of Mexico, there’s a little town called Oaxaca that did a grand experiment in law enforcement. Faced with the silent output of hundreds of security cameras in public spaces, they hired deaf officers to read lips and look for clues for solving and preventing crime. And it worked. These amazing people have found thieves, murderers, buried bodies, and they’ve even saved precious human life from horrible kidnappings. The deaf officers are called the Angels of Silence. Their story is true, something so remarkable in my eyes that it inspired the fictional tale you are about to read. There’s even a little HPC in there for you. Something about town squares have always drawn me there. Today, as I walk on these old cobblestones of Oaxaca, I see the people here laugh and connect, come and go, and it’s as if I was truly alive in this space, though just observing their love for each other through some kind of glass. I’m here for the comet. 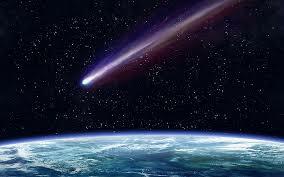 It’s my comet, actually. They named it after me, Jack Kassatra, long after I first detected it while working in Hawaii at the Subaru telescope. It was just a smear of light then, but tonight will be its brightest night and I’m here in this town for the best possible view as the earth passes through its tail. Yes, I say to myself smugly as I look out on this town square, Kassatra’s Comet is coming. And its like the entire planet is geared up for the grand cosmic light show. I’m headed for coffee when my publicist texts me about the press conference later today. I’m walking and typing with my thumb and thinking about what I’m going to say before the cameras and suddenly a bicycle comes out of nowhere. She doesn’t see me in time to stop as I step into her path. The front wheel goes over my boot and she crashes into the curb, head over heels. It’s all so fast. I’m not injured, but I go to her, flailing on the pavement with her left leg bent horribly behind her. “Are you OK?” I ask. She looks at me in a daze, this lovely young Mexican woman, but she doesn’t speak. I’m thinking her heritage is probably Mixtec, a native people to this region that goes back far beyond the Mayans and Aztecs. She looks at her body, obviously assessing the damage, and raises her hands slowly to make some signs. She’s mute. “My leg hurts,” she signs. I understand her. She seems surprised when I sign back. She nods and I help her to stand. She’s got a limp and when we pick up her bike, the front wheel is bent and it’s obvious she can’t ride the thing. I tell her my name is Jack and that I want to help. Where was she going, anyway? “I’m Erika,” she signs. She looks into my eyes and there’s this pause, almost like she’s known me my whole life. I hear the sirens before we get there, but I don’t say anything to her as we walk slowly to the station. There are squad cars, fire trucks, ambulances clogging the entry to the police station. I see they’ve got the yellow tape across the entry as we approach. The officers in their bulletproof vests look at me suspiciously as I walk up with Erika. Chief Gerrado is there and his face is drawn like he’s just seen something horrific. He comes to us hurriedly, looking at her closely for signs of injury. “Erika, are you alright?” he asks. She nods slowly. She doesn’t sign to him. That means he can’t read sign language. “She wants to know what happened,” I say to him. Erika leans towards me and pulls me closer so he can see. We enter the squad room where Erika once worked. The place is a disaster. Tossed chairs, bullet holes, blood everywhere. Two policemen are zipping up the last of the nineteen body bags. The younger one, a handsome boy no more than 21 I’d say, he runs outside to vomit. Erika is weeping uncontrollably as she looks around at this aftermath of this unholy mayhem. She leans on me and I catch her as her knees begin to buckle. She signs one thing to me, and then she goes silent for the rest of the day. Chief Gerrado has me in the interrogation room. He wants to know everything about me. Who am I? Where was I at the time of the murders? Who can vouch for me? How did I come to be here at this particular horrific time? We go over it four times. He’s looking for consistency and that’s all I can give him. The young cop knocks and comes in with the daily newspaper. My picture is on the front page along with a drawing of the comet. I am about to walk out and then stop and look at him. He shakes my hand. His fingers are strong and calloused and he looks me in the eye with the dead serious look of a man on fire. The hairs stand up on the back of my neck. I am going to do this, and now I think I know how. It is like a breath of fresh air when Tom Braman answers the phone. His raucous laugh is the kind of thing that lights up a room and the sound of it brings me back to my college days when we were roommates. “Professor Jack, what have you gotten yourself into this time?” The story of the massacre of the Angels of Silence is all over CNN, he says. His office is already reaching out to the Mexican authorities. While I’m talking, Gerrado walks in with a portable hard drive and hands it me. It’s all the Oaxaca camera footage from the past week– four Terabytes compressed. “How do they work?” I ask him. “But there is no sound,” I tell him. I walk the disk to the fedex office on the other side of the town square. It will be dark soon. Comet Kassatra is coming. Erika and I are standing on a hill with my telescope. The comet is at it’s brightest and I bring her over to look. “So beautiful,” she signs to me. I hold her hand and look up to the night sky. I notice she is trembling. I hold her close. We stand in this beautiful silence together and I feel something inside me stir that I thought had died a long time ago. “How is it that you know how to sign?” she asks. I feel a sigh escape me and there’s this pause I cannot help. Erika looks at me, staring into my eyes and I suddenly I know everything she wants to say. It’s a week later now and the comet is gone. I’m at the station with Erika. She is the last of the Angels of Silence, and she keeps going through all the footage she can, looking for clues about the murders. I bring her coffee and she barely looks up. My hand is on her shoulder when my phone rings. It’s Tom from the FBI. I’m trying to absorb what Tom is saying to me. Two hours later, I’m looking out at the town square again. But the scene is very different and I can’t quite place it. Then it hits me; there is no sign of the love I saw before. My phone rings. It is Tom. I walk to the squad room where Erika is waiting. I tell her they found it and she has me come sit at the terminal next to her. I pull up my gmail and open the video file Tom just sent to me. Four men are talking in the city square. A tall man has his back to the camera and the others are nodding like he is the one doing all the talking. And in return, you will spare our families from the comet? We will take them all as you say. But why can no one know, Diablo? The tall man in the video turns. Erika can now read his lips. Now I see the sour note. His face changes right in front of my eyes. My knees are going weak. I am crumbling. Erika looks up at me. She says she’s always known who I am. I look into the dark pools of her eyes. What I see is pure love, an invincible force of renewal that will surely vanquish me. But there is nothing to fear. You see, somewhere up there, Angels of Silence watch over us. And if you listen closely, the roar of their hearts is as big as the sky. Rich Brueckner writes about people and technology at insideHPC.com. He lives with his 14-year-old clone in Portland, Oregon.